This is a shadow for the 4th round of SpinTunes #7. It was a “Photo Finish” prompt. Although this time the judges are allowed to shadow, up to now I didn’t feel comfortable doing that while I was ranking other people’s work. As that onus is removed from me this round, I feel comfortable about shadowing, and have done so. Sadly, I probably won’t have time to properly produce it. My fellow judge Brian Gray made the thought-provoking implication that “inspired by” pretty much gives the contestant carte blanche to submit just about anything so long as it results from a train of thought originating with the image. So let's look at the image. You can click on it to get to the photographer's Flickr page and select other resolutions. I took Brian’s comment as inspiration to write, not about the subject of the image, but about the image itself. This choice was informed by the recent tendencies of many of my friends to take up digital photography, and in particular, HDR (high dynamic range) photography. Now, when done properly, digital manipulation results in some really epic work. When done poorly, this can look like really, really bad plastic surgery on a formerly beautiful woman. Keep in mind that I’m not saying this was done poorly. After all, I'm one of the folks who selected this image! What I’m saying is that the presence of manipulation here got me thinking about a general tendency of beginners to over-manipulate. They’ll force too much contrast, super-saturate the colors, and over-compensate the exposure of the various parts of an HDR image so that it’s very obviously a photo-manipulation. The world is mine, I'll seize it! You'll see it as I please it! My Flickr fans will worship me. My fans will worship me! I used the phrase “digital eye” because I wanted that organic connection. The photographer doesn’t think of the camera as equipment separate from himself. Rather, it’s an extension of himself. Whenever I think of a salesman in song I always imagine Elton John and Bernie Taupin’s “Can I Put You On”. So I used "in a blue shirt" to identify my modern interchangeable Best Buy salesman in the same way that Taupin uses the Trilby hat to identify his peddler. I didn't consciously think through the "selling excitement" line... I've just taken it for granted for many years that this is what salesmen do. My brother often says, "A man doesn't buy a drill because he wants a drill; he buys a drill because he wants a hole." In the same way, I say a person doesn't buy a camera because he just desires to possess a camera: A camera is a “time net”, and you use it to trap moments. He buys a camera so he can trap the really great ones. Without a camera you get to experience that moment once. With a camera you get to relive it over and over. I think that's what I was trying to say there. I know... it's a lot to try to fit into two words, and it goes by pretty quickly. It’s not the sort of thing you want someone to think about. Instead, you hope the audience gets it subconsciously. I am having a fun little dig at the fictional photographer here... he's so absorbed in his hobby that his life is reduced to those moments that he has captured. Those images he takes are things that are happening to other people. But he captures them, and they're now his. Between the frames he has no life to speak of. This is pretty much to set up the concept that this guy lives inside his camera; that's his "real world", of which he is the master. From this point on it’s a pretty mundane exercise of the metaphor I’ve chosen... that of a man who is dissatisfied with the world as it is and who wishes to create a “better” world to replace it in his memory. “Better” here is really subjective, and as the photographer in this story is an amateur enthusiast, it consists of gilding every lily he sees. All the clichés... too much contrast, color saturation, and HDR, typified by an image that resembles any frame of the movie 300 and exemplified by that intricately detailed sky in the challenge prompt, reminding me of the sea. As he gilds his lilies, our amateur photographer experiences the rush of power conferred upon him by his expensive equipment and Adobe Photoshop... and he also is confused as to which is the “real” world. An HDR artist will either tell you that the images produced expose the “real” world that you cannot see (that is, a reality that’s deeper than your vision can perceive) or that he’s capturing in the camera the world as you actually see it, and which “normal” photography can’t. The latter might be true if great restraint is used, but usually in HDR we see hard contrast and color definition that counter-intuitively combines in a way that yields a glowy soft-focus impression that is immediately recognizable as being unnatural, and which therefore cannot possibly be the world as perceived by the human eye. I therefore choose to cast my fictional photographer as a mini-god who re-creates the world in his own image. 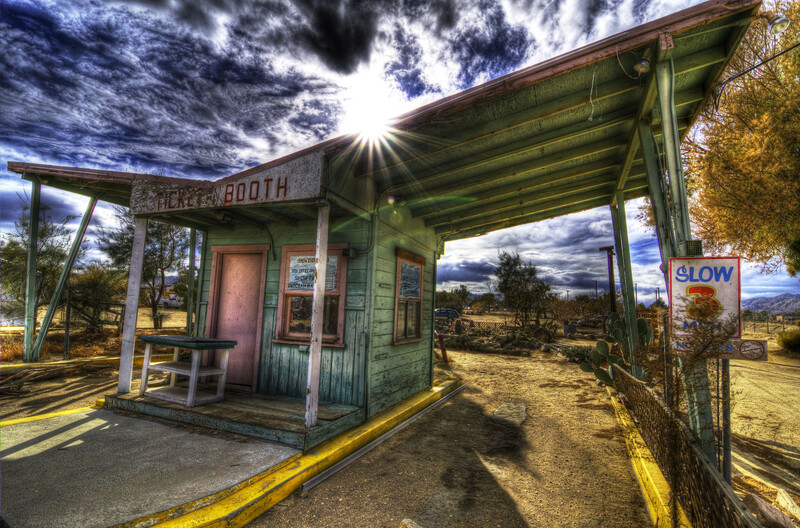 The line “It’s my ticket to a new day dawning” recalls the fact that the image is of a ticket booth and sunburst, and is a reminder that this is in fact the image that inspired the song. But it’s also a reminder that this “new day” occurs in the world of his creation. As in Genesis, “the evening and the morning were the first day”. Even though Photoshop and HDR are recent inventions, I wanted this song to sound very grounded in the early 1980s. That was the moment of the “me-generation”. It was an era of excess, and excess is what these lyrics are about. So I wanted to push the excitement mentioned in the first verse with short, choppy chords. These would open out in the “drab and boring” verse to form a hook on which to hang the concept of the photographer’s “god-like powers”. This ends in the word “sea” in a really drawn-out over-emoted crescendo, which would come into it’s own when re-used on the “worship me!” line at the end. If this were produced the way my brain hears it, the end result should be to the ears what a supersaturated image is to the eyes... just subtly “too much” in every respect. It should evoke images of "80’s hair", glitter in the makeup, colored lights and a disco ball. I’m pretty sure that someone judging the song would despise it for the very same reasons that would in my view make it an artistic success. Of course, I’m hopeless at such production, so you may have to settle for just a piano and my voice. Artwork Note: I needed a replacement photo for my Bandcamp track art, so I asked my brother Everett for a really bad one. None of his were actually bad enough to really illustrate the issue, so the one I did use has been further saturated and cropped by me. His photos can be seen on his Facebook page.